Last night I went to the Toronto Maple Leafs vs LA Kings game. We drove up for the game and had amazing seats that were center ice two rows back between the teams benches. The next crazy thing for the night was that two rows in front of us there were two rows of 3 posh seats. I was going to sit there if no one showed up but then a guy walked by and sat down in them. I looked at him closely as he looked very familiar. I asked my buddy if the guy looked like Cuba Gooding Jr. He was like, "Kinda...yell his name and see if he looks" So I was like "Cuba!" and sure enough he looked around and it was him...pretty cool. 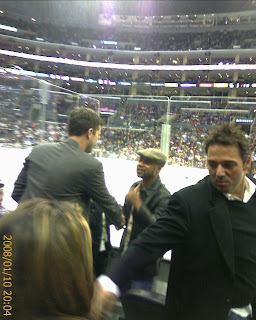 Then about a minute into the game Joshua Jackson showed up. Which was funny because we were making Mighty ducks jokes all night...FYI: Joshua Jackson was Charlie in the Mighty Ducks. Anywho...here is a pick of Cuba saying hey to Josh.